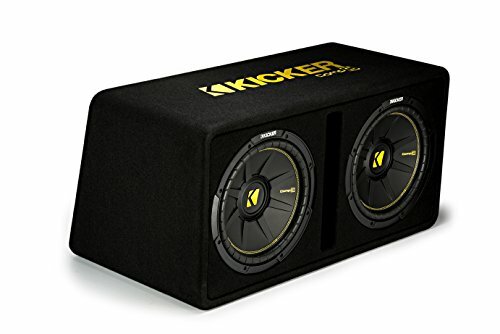 Keep the bass bumping in your ride and take your car audio to the next level with the Kicker 12-Inch Dual Subwoofer Enclosure. This quality, loaded subwoofer box enclosure is built with heavy MDF construction and thick black carpet for durability. The dual 12-inch subwoofer enclosure works best with 600 watts of power and uses a ported design. It features 2-ohm impedance and 98.4 dB of sensitivity. This sub box is designed to maximize bass is less space, and can deliver great results in even the smallest trunk area. Get more out of your music and ride in style with the Kicker Dual 12-Inch CompC Vented Loaded Subwoofer Enclosure.